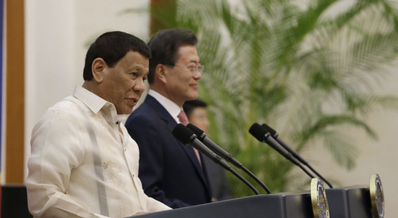 The controversial president of the Philippines, Rodrigo Duterte, arrived in Korea on Sunday to meet with President Moon Jae-in the following day. Duterte, who is largely shunned internationally for his brutal war on drugs that entailed thousands of extrajudicial murders and his abrasive manners, raised eyebrows here when he arrived in a shiny black leather jacket. Duterte likes to boast of his he-man antics and personal brutality in his home city of Mindanao, where he was mayor. The government sent a not-so-subtle message that the visit is strictly business, sending the head of the Defense Acquisition Program Administration instead of a senior diplomat to welcome him at the airport. Jeon Jei-guk nominally holds the rank of vice minister, and a Ministry official said, "It is customary for ministers and vice ministers to greet visiting foreign heads of state, and the head of DAPA was chosen this time." The Philippines bought 12 Korean FA-50 fighter jets back in 2014, and Duterte last year said he wants to buy 12 more. The Philippines has also apparently shown interest in buying Korea's Surion helicopters.